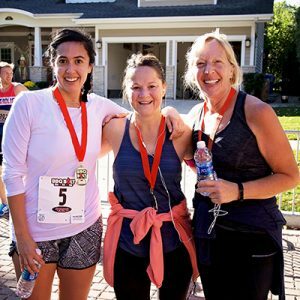 The Downers Grove Park District is spicing things up this summer with the inaugural BBQ Bolt Run/Walk event on July 20! 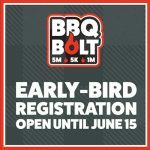 Starting and finishing at McCollum Park, the BBQ Bolt brings the community together to celebrate summer with fitness followed by a post-race Picnic in the Park featuring BBQ, beer, festivities and a kid area! Every registered participant (even kiddos!) will get to enjoy a “Picnic in the Park” complete with BBQ, beer or lemonade! Participants in the 5-Mile, 5K and 1-Mile events will receive a medal and a short-sleeve technical T-shirt (guaranteed if registered by July 1). Participants of the 50-meter Dash will receive a participation medal only. Awards will be given to the overall first-place male and female in 5-Mile and 5K in addition to age category awards for top male and female finishers in each distance. Groups of four or more can create a team and receive a discount on registration! Members of a team can participate in any distance they choose. If you are a family of four or more, create a team and receive the discount! Discount of $5 per registrant will take place during checkout. To learn more and or register at visit their website at www.bbqbolt.org!